The Barn Owl (Tyto alba) is a very distinctive looking owl, with a white, heart-shaped face and small black eyes. In a little over a week, one very heroic, fictional Barn Owl named Soren, will appear in movie theaters across the nation. 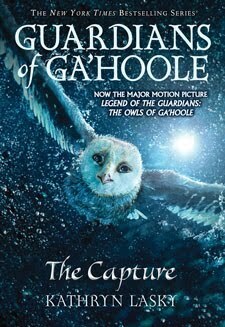 Legend of the Guardians: The Owls of Ga'Hoole, the 3-D animated family film, opens on September 24th, 2010. The movie, based on the first three books in Kathryn Lasky's bestselling Guardians of Ga’Hoole fantasy series, will most likely ignite a renewed interest in this beloved book series. Thanks to Scholastic, I recently had the opportunity to read the first book, Guardians of Ga’Hoole #1: The Capture in the 15 book series. Born into a loving family, a baby Barn Owl named Soren lives happily alongside his parents and siblings, listening to his father tell stories about a Great Ga'Hoole tree and a special order of owls that rise each night to perform noble deeds. One dreadful day, he falls out of the fir tree hallow before he is yet fully fledged. A group of evil owls capture him and take him to the horrific St. Aegolius Academy for Orphaned Owls, a place that snatches the young and innocent and terrorizes the other owl kingdoms. There Soren tries to thwart the brainwashing "moon blinking" attempts, and together with his new Elf Owl friend, Gylfie, plans an escape. Along the way, the two young owls befriend two more owls, Twilight and Digger, and the group bands together to find the Great Ga'Hoole Tree, in a search to discover truth. Is the epic story about a group of owls that "rise each night into the blackness and perform noble deeds" truly real or only a legend? Obviously, extensive research of owls went into the writing of this fantasy novel. Lasky skillfully slips in various owl tidbits and facts along with all the wonderful details of life in the numerous fantasy owl kingdoms. Readers learn about nesting, fledging, blind snakes that housekeep and owl pellets. Lasky bases her characters on real owl species and even made sure to include the smallest and largest in the owl world -- the Elf Owl and the Great Gray Owl. An ordinary Barn Owl with a hero's heart, Soren's character is probably my favorite of all the owls in the book. Not only is he a hero, but he displays kindness and is an empathetic owl. Lasky creatively uses several special made-up owl phrases like "good light" instead of "good night" and exclamatory phrases like, "Oh, for Glaux's sake." This intense and quickly-paced read sometimes skirts the edge in terms of darkness and violence, and one specific scene involving vampire bats left me feeling a little shocked and uneasy. The recommended age level for this middle grade book is 9 and up, so I'd hesitate before giving it to an overly sensitive, younger child and would definitely not read it aloud to my kindergartener. However, for older children, especially boys and reluctant readers, I'd highly recommend the books in this imaginative fantasy series. The first book certainly spurred my interest in owls -- I even want to dissect my own owl pellet. Know where I can find one? Don't let those super cute owl posters mislead you. If the movie is anything like the books, there will be plenty of darkness, heartbreak and combat. I look forward to seeing how the new movie compares. I had no idea that this was book before it became a movie! It's good to know though, because that means the book is probably fantastic! Ah, we saw a trailer for the movie last night. My husband and I kinda blinked at each other and said "Weird. Must be based on a book" at the same time. You've saved me the trouble of googling "fantasy owl movie" (because remembering the title didn't happen). I always try to read the books they're making kids movies of. This is one I definitely need to check out! this looks like a good book - would love to win it for my son. we can't wait for the movie. It would be nice to read the book before the movie. Thanks for the chance. This looks like a great book. I have heard a lot of good things about the series and cannot wait to compare the movie to the book. Thanks for the giveaway. The trailers look interesting, and I'd love to read the book first! Please enter me - histtheo1 at yahoo dot com. I saw a preview for the movie and want to read the book first. Reading a book before seeing the movie is the best way to do it. I'd love to read these and pass them on to my grandchildren. I love these type of fantasy novels. Please enter me in the contest and thanks for letting us know about it! Sounds like an awesome book! The movie looks good too! The movie will be good, but the book is bound to be great! And here's an original entry comment :-) Keep up the good kid lit. fight! We would LOVE this book, my kids are very excited. Hope to win!! This is a wonderful opportunity to get to read both books in the series before I see the movie. I've been seeing previews for the movie and would love to read the book before seeing it. It sounds like a great story (though it sounds like one for me, and not the little one). Thanks for the chance to enter! Thanks for the thoughtful giveaway. I must read books before I watch movies not to mention it was a great idea to include the first book in the series because I always have to read series in order. My daughter and I love owls. As a matter of fact, we collect anything with owls. We also plan on seeing the movie. It would be awesome to read the book first! Please enter me in the giveaway. My students would love this book. My kids really want to see this movie-Hopefully they will wnt to read the book too! I'm actually reading The Guardians of Ga'Hoole right now and adore it, but would love to win a copy to give to my neice, because I think she would also love it. I am also a follower on the blog. my daughter was trying to finish the 1st one, but she is a slow reader and the library had to have it back because someone else had reserved it. Owning them would be nice, then she could take as long as she wanted to finish. My daughter read all 15 books of Ga'Hoole and now she would like to read more books of K.Lasky. these books look like interesting! I subscribe to your blog in my google reader! I'd never heard of the books until the movie came out, but judging by the movie trailer, they're definitely worth a read. How thoughtful to also include the first book when giving away books in a series because not only do we have to read the books before we see the movie but we also have to start from the beginning. we haven't added this to our book collection yet, I too can't wait to see how it compares to the movie. These both look like books that my son would enjoy reading. love to read books before watching the movies. Make my kids do it too, easier to compare and contrast than. Have to get the learning in anyway you can. The Guardians of Ga'hoole series is my daughters favorite series. She has read them all. The movie was pretty good too. She can't wait to start the new series. I am following via GFC: Jenn S and via google reader. I saw this film last Sunday and I enjoyed it! I can't wait to read this book-The book is always 100 times better than the movie. My daughter would love to read these books! I have seen a lot about this book lately. Makes me interested in taking further look! I have been wanting to read this for a while now! Thanks for the chance! My kids want to go see the movie, but I always make them read the book first! I didn't know there were books. They look like great reading. I hadn't heard of this before I started seeing the previews for the film. I love the story involving owls and I'd love to read this! I saw the movie in 3D the day it came out! I had won 2 tickets in a Coke contest, so I invited my friend to go with me. We'd never heard of the books, but seeing those adorable owls, I couldn't resist seeing the movie, just to see the owls! I normally do read books before I ever see the movie, but not so in this case. I knew this was a book before being a movie, but my tendency is usually that if both are out, I'll read the book after the movie. It stops me from saying "that's not in the book" or "where did _that_ come from?". I remember doing a lot of that while watching "Prince Caspian" when it was out. If the movie/book are close this time, I'm definitely more interested in reading the book first. It definitely sounds like something my kid would like. I think it looks cute...would love to read it! I'm an elementary school librarian and have never gotten around to reading the Guardians of Ga'Hoole series. Maybe if I win, I will finally read this acclaimed series!